For those who don’t know, one of South Africa’s biggest geek events is happening this weekend in Cape Town from Saturday 28th April to Sunday 29th April at Cape Town International Convention Centre. 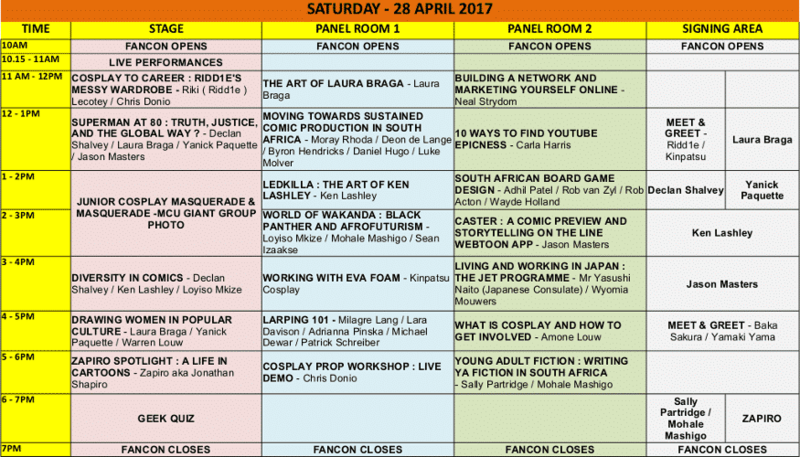 FanCon, which offers a jam-packed programme of comic book panel talks, workshops, autograph sessions, cosplay masquerades, and everything geek-related, is an annual comic convention which attracts thousands of people every year. The good news is that you can win an Ultimate FanCon fan hamper, which includes double tickets to the entire 2-day convention, a R250 FanCon official store voucher, a R249 Rockefella voucher (which you can use to purchase a t-shirt at Rockefella Clothing) and a Funko POP Maleficent FanCon exclusive (courtesy of Funko SA by Gammatek). The convention was also the first to bring renowned comic book creators and cosplayers to the country. This month FanCon returns and promises to be even bigger and better than before. With guests like international comic book artists (Declan Shalvey, Yanick Paquette, Ken Lashley, Laura Braga, and Ulysse Malassagne), world-renowned cosplay artists (Riki “Riddle” Lecotey, Kinpatsu) and speciality costumers and prop makers for Marvel movies (Riki Lecotey and Chris Donio), it’s bound to be something special. To stand a chance of winning this awesome Ultimate FanCon fan hamper, all you need to do is tell us why you love FanCon (in the comments section below). Please use a working email address. Competition closes Friday, 27th April 2018. Please note winners will be contacted by Friday afternoon. The vouchers (FanCon store, Rockefella, and Gammatek) can be redeemed at the relevant stands on show. The Giveaway is restricted to readers residing in South African who have signed up for our newsletter only and cannot be exchanged for cash. Terms and conditions/Site Disclaimer rules apply. One entry per person. The winners will be contacted via email. The prize excludes travel, is non-transferable and cannot be redeemed for cash. FanCon is the magic personified, and I get to interact with it, for real! I would love the dress up experience!! Please please! My first Con experience was with Free Comic Book Day hosted by Reader’s Den 5 years ago. Loved this because of all the comics, action figures and geek fixes you need!!!! This experience eventually matured into FanCon…the main reason for loving this event: FanCon IS Life! It reminds everyone that it’s never too late to have a happy childhood. Simply because I’m a geek. Love it because it is an opportunity to get together with likeminded enthusiasts in an epic environment, besides if I won I would take my son and it would blow his mind. What can I say? Even though I don’t read comics anymore, the stories I read years ago are still stuck in my head. 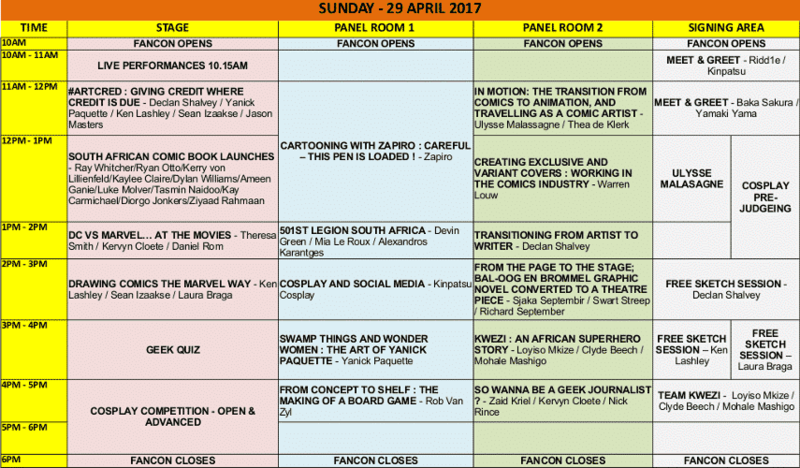 Beautiful stories, thrilling action… that’s why, when I first heard FanCon was coming to Cape Town, I was excited! And I’d love to win the 2-day pass, because. It would make the perfect weekend, especially since I intend to watch Avengers Infinity War! It’s a fun, happy place. We love going! I love FanCon because to me it’s more than just a Geek convention Fancon is where all fans of pop culture are being celebrated, represented and included every step of the way! Local and international talent! photo ops, and one awesomely amazeballz experience! I’m a huge comic book fan and all things Star Wars! So much so that I’ve dedicated my lounge to all things Marvel comics and started a tattoo collection too! I’ve only been to FanCon once before and would love an opportunity to throw on my Poison Ivy handmade cosplay outfit and attend this year again but unfortunately my bank funds say “no”. 😣. Hoping Fortress of Solitude can be like the other parent and say “yes” 😉😋. I attended my first FCBD 5 years ago, I had just moved to Cape Town and it was magical. It absolutely blew my mind. I’ve been attending every event since. It’s amazing how the community has grown and how FCBD evolved into Fancon and how it keeps growing ❤️ The cosplay, the art, the shared enthusiasm for everything geek. I just love everything about it. It’s fun and I would love to go this year. I like looking at the specials and cosplay. I attended my first FCBD 5 years ago, I had just moved to Cape Town and it was magical. It absolutely blew my mind. I’ve been attending every event since. It’s amazing how the community has grown and how FCBD evolved into Fancon and how it keeps growing ❤️ The cosplay, the art, the shared enthusiasm for everything geek. I just love everything about it! It will be my first FanCon this year (I actually only found out about it post-event last year). What I love about it is that people get the chance to express themselves as they wish without fear of judgement – they can cosplay as any character from any universe. The merchandise that is available. And most importantly, being able to meet like-minded people, who they may never have met if not for events like this. Bringing the fandom to the locals! Will definitely be attending this, went to Geekfest in PE, can’t wait to support the Cape Town scene! Because of all the excitement and anticipation my 2 boys get from it! This is the event of the year! We would love to see and experience all the wonders and get to hear the masterminds behind these wonderful creations! My daughters dream is to follow on this exciting path and what a wonderful opportunity to hear from such talent! I’ve been a fan boy my who life, but have not been able to attend comic-cons because of work commitments. It would be awesome to attend, because FanCon converts your imagination into something tangible. We do Fancon as a family, me, my partner & our 2 kids. Once we get the first notification about it, it gets placed on our family calendar & then the countdown begins, days leading up to Fancon weekend our house is crazy with excitement & getting costumes ready, nothing else gets done unless its Fancon related. I’m surprised we still have jobs & my kids has not yet gotten suspended from school(Is this anonymous,lol) We even made a flip file(old school style) to make sure we don’t miss anything!!! WE LOVE FANCON!!! I love Fancon because its the one place to meet people with the same interests as me, there aren’t many events in South Africa that attracts this sort of crowd and its the reason why I keep on coming back to this event. I’ll be going along to listen to some of the panel discussions, among other reasons. I’ve frankly never been, but I would love to see everything it has to offer and really indulge myself.